We’re exploring a new region of Mexico, and although there are many differences, there are also similarities to our experience up in the Sea of Cortes. We’re traveling from Banderas Bay down to Zihuatenejo, stopping in various anchorages and a few towns along the way, typically only staying a few days in each place before moving on, but allowing our schedule to be fluid and easily-changed. Shortly before we left La Cruz, we met a young man who was “hitchhiking” down the coast by boat; this is often called “crewing”. Many boaters appreciate an additional hand around to help share the chores of sailing and daily life, creating a niche for flexible travelers to travel on the cheap. James had been in La Cruz for a couple of weeks, looking for his next opportunity, and we met him at a “Half Moon Bonfire”. He works summers fishing salmon in Alaska, and during the rest of the year often works with his father in Santa Barbara, mostly catching lobsters. He asked about bringing a friend along, and we were delighted when it turned out to have been someone that was already a friend of ours. We met Alyssa (Aly) last season in La Cruz, when she was doing some jazz and fire-dancing performances at our favorite restaurant. She had gone back to the States last spring, but decided that she wasn’t quite finished with La Cruz, so she has come back for 6 months or maybe more. Last summer, like James, she had hopped on a southbound sailboat in San Francisco and sailed down the outside of the Baja peninsula (a little too fast if you ask us!). Now she’s living on land and was thrilled at the opportunity to spend more time on the water. Both of them have been great traveling companions, and we’ve had an opportunity to think about what it would mean to take on crew for a longer duration. We left La Cruz late morning and had a wonderful sail, including an overnight, to Chamela. We spent a couple of nights in this lovely anchorage. Once again we’re in beautiful clear water, and although it’s a little bit chilly we’ve enjoyed snorkeling around the rocky points around the various anchorages. There are lots of lovely fish – and occasionally one becomes dinner. There are a number of rocky islands in Chamela Bay, and we anchored in between a pair of them. We drove the dinghy over to an interesting beach, the end of which turned rocky and formed a point. Waves came over a small stretch of this sandy beach from both sides of the point, and we had fun rolling in the surf and being batted from one side to the other. The next day we had a short sail to Paraiso. Although this place is beautiful, and the name is evocative (it means “paradise”), we spent a very rolly night at anchor. In the morning we puttered around the bay to look at the sea caves, a blow-hole and some impressive crashing waves, before continuing on our way. Our next stop was the bay of Tenacatita. This is a big bay, with three places one can anchor – and we ended up visiting them all! When we pulled into the main anchorage, there were three boats there, and two of them were friends that we were happily looking forward to seeing again. 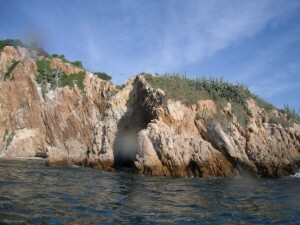 We spent the next day snorkeling with our friends on Anon at the second of the anchorages, the one called The Aquarium. It was a really beautiful site, and we were all reluctant to call it a day when the sun began to get low. There is a resort hotel on the beach which fronts the main anchorage, and this evening there was a wedding going on. Afterwards, and late into the night, there was music wafting across the water. They lit candle lanterns which then rise up into the sky propelled by the heat of the candle. I’m not sure how high they go, but we watched perhaps 20 of them drift out across the water before extinguishing themselves. It was like a temporary constellation created in honor of the occasion. 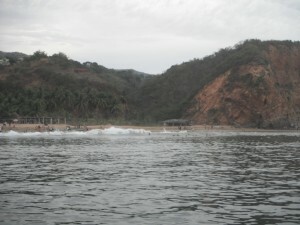 The last day we headed over to the third anchorage, in front of the town called La Manzanilla. We landed the dinghy in the surf in front of the town, amidst fishermen, swimmers, and crowds of pelicans. Unfortunately there were also some rocks, and our dinghy’s wheel found a couple of them. The strut snapped in two, and the dinghy now has a limp. 🙁 Actually, we’ve found it easier to pull it up the beach with no wheels than with one out of balance. We’ve ordered a replacement strut, and it will catch up with us in March when Kathy’s mom comes to visit. On Aly’s last night with us, we had dinner at a small restaurant that served teriyaki food, scouted the town out for the bus stop, and spent an hour or more sitting in the town square watching the locals play with fireworks and walk laps around the square while socializing. The next morning after dropping Aly at the bus stop, we visited a crocodile preserve at the end of town. We paid 10 pesos (about 80 cents) for the privilege of walking a board-walk along the estuary. We saw more than a dozen large adults, although they were pretty fat and lethargic – probably part of the trade-off for keeping them in a penned-off section of the estuary. It was very cool! As we moved on, we had another silly encounter with nature, where nature won the round. We were traveling with a couple of fishing lines in the water. We heard a funny noise and looked back to see what had happened. There was a dorado leaping in the water, so we thought perhaps he was on one of our lines. When we went to figure out which line it was, though, we noticed that one of the hand-line spools was missing. Somehow the knot securing it had come undone and the whole package went into the water when this unfortunate fish bit. We saw him leap 3 or 4 times, and each time the brilliant pink lure leaped out of the water with him. 🙂 Dan hopped in the dinghy to see if the spool was floating, and if so then perhaps to try to recover it, but the dorado stopped jumping and there was nothing to do. We’d like to believe that we’re getting better at this, but we’ve clearly still got a little ways to go! We spent the next few days in Barra de Navidad. There’s a good-sized bay here, with a large lagoon that feeds into it. The lagoon has a narrow channel that is just deep enough for our boat, so we went through at high tide just to make sure. You really have to be careful here that you pay attention to the depths because there are sand bars all over the place. We ran our dinghy aground more than once, surprised to discover that we were in ankle-deep water. We were tickled (and perhaps just a little bit unnerved) one day when we drove the dinghy back to the boat and we passed a guy standing in waist-deep water fishing with a net – he was almost a quarter of a mile off shore and only about 10 feet from the channel that we’d taken the big boat up just the previous day! 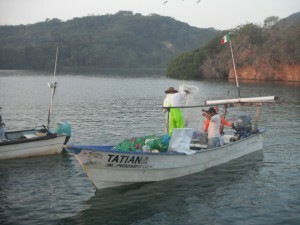 Early in the morning, the fishermen in their pangas head out of the lagoon, but first they stop to catch a little bait. Since the fish tend to school underneath boats (I couldn’t tell you *why*), the fishermen throw their nets quite close to the sailboats that gather in the lagoon. Here’s an early morning photo of some pangueros at work. There’s a funky old hotel in Barra, called the Sands, which caters to the cruising boaters. They provide a dock to park your dinghy while you go into town, and they allow us to all hang out at their pool and enjoy the sun. We enjoyed a few afternoons of sunbathing and wi-fi internet there. There is also a fancy resort hotel, the Grand Bay, on the other side of the entrance channel. Some of our friends stayed a few nights in their marina, and hosted us around the fancy pool with waterfalls and coconut drinks. Ah, the good life! We wanted to do something to celebrate the winter solstice, and our friends on Anon told us that they were planning to spend it back in Tenacatita, so we backtracked a bit to join them. We liked Tenacatita so much that there was no arm-twisting required! We all participated in a worldwide meditation event for an hour starting at the moment of the solstice, which local-time meant 5:11am, and another hour in the midafternoon. Even though none of us felt a different connection with a collective consciousness, we all felt that it was a wonderful way to acknowledge the morning (and we all vowed to do it more often!). That evening, there was a dinghy “raft-up”, with an hors d’ouevre pot-luck, and we organized a fire on the beach afterwards. The dinghy raft-up was an event designed to help the folks in the anchorage (there were more than a dozen boats during most of the time we were there) to meet one another. The first person to arrive anchored his dinghy at the designated location, and as everyone else arrived we tied our dinghies to his or to someone else who had already joined the floating party. The guy who organized the event (for some reason, the community calls him “the mayor of Tenacatita”) gave a short speech and had people around the circle introduce themselves. It was a pleasant gathering, and it was nice to connect a few more names and faces to the names of their boats. About half of the attendees also joined us on the beach for a fire and more conversation. We brought our fire-pit because we weren’t sure if it was legal to build a fire on the beach, but when we got there we found a beautifully arranged ring of rocks with a stack of dry brush nearby. A lovely way to end the day, even if the world didn’t come to an end. A day or two later we returned to Barra (de Navidad) to participate in another cruiser event: a Christmas pot-luck held at the Sands Hotel. We were skeptical that we could find a place inside the lagoon that was large enough for our boat, since so many boats had arrived for the event, so we decided to stay off the beach of a nearby town named Melaque. This town is (not-so) fondly referred to as “Rocky Melaque”. 🙂 So we tucked into the shore as close as we could, and set out a second anchor from our stern, to help keep our boat from swinging in the wind in such a way that the waves would hit us broad-side. If they come from the bow of the boat then the pitching motion feels much less dramatic than if there’s also a side-to-side rolling action. We enjoyed our stay in Melaque. We did some shopping and wandered the town’s streets one day, took a bus to Barra another, and rode our dinghy the two miles to the Christmas party. Kathy was invited to be the “Magic Elf” who runs the progressive gift exchange, where everyone comes with an anonymous gift and goes away with something that someone else brought. Sometimes you get a gift that you unwrapped yourself and sometimes you can “steal” something that you like from someone else. It’s a fun way to spend a couple of hours with a congenial crowd. The gifts that were “stolen” the most included a bottle of red wine, a set of bongo drums, a conch shell that you can blow into to get a lonesome sound. The other gift that was in really high demand was the six-pack of Fat Tire beer that we brought. It’s impossible to find in Mexico and is very highly valued. While we were at the party, James met up with a young woman who was crewing on one of the boats. They struck it off, and before you know it we had another crew mate! MaryJo is sweet and perky, cute as a button, and learning whatever she can to make real her dream to buy her own boat and circumnavigate the world. wanted to do it all under sail, if possible. When we were traveling quickly, it looked like we might get there in as short as 3 full days (and nights), but when the wind was lighter a full week seemed more likely. On the second afternoon, a brown booby (with green feet!) made a clumsy landing on our deck. We talked to him and watched him off and on all evening and into the night. The next morning he hopped off and swam in the water for a while before launching into flight. Unfortunately his flight wasn’t very successful, and he couldn’t really get airborne. He tried 3 or 4 times, and the last time came back to the boat. His first attempt to land on the boat again could have been taken out of a slapstick cartoon like The Roadrunner. He tried to land on the rail of the boat, but chose a stretch that was crossed by a big chain (attaching one of the stays for the mizzen mast to the chainplates on the hull). He slammed into this chain and slithered down the side of the boat into the water. The next attempt, although not very graceful, was much more successful. 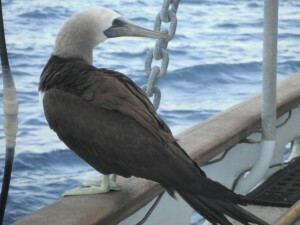 We were worried that Bobby the Booby (as Kathy nicknamed him) was not very healthy. Fortunately his strength did eventually return, and he was able to successfully fly off towards the shore later this same afternoon. Perhaps he had an injury to one of his wings? We’ll never know, but we sure are glad that this story didn’t end in tears! On New Year’s Eve we were still underway. The skies had been pretty cloudy for this passage, and they continued to fill in over the course of the day. In the afternoon the winds picked up and we started to get a little bit of rain. We were enjoying the sail, but the rain kept us inside. There was a little bit of lightening, not on top of us, but kinda close. Then without any warning the winds picked up suddenly, and the boat heeled dramatically to almost 45 degrees. Chaos reigned for a little while as things on counters found a more comfortable place on floors. The cap rail was submerged and green water was flowing over the decks on the downwind side of the boat. 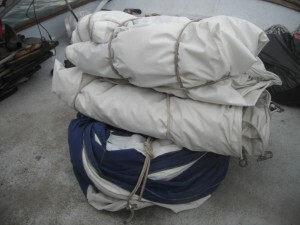 We tried to furl the mainsail, but the winds were blowing too hard – about 50 knots! The sail jammed and was flogging loudly as the wind howled and the boat heeled strongly to port. We eventually got the other sails pulled in, but sustained varying amounts of damage to 4 of the 5. After about 20 minutes the winds subsided to a much more manageable 30 knots. We decided to head in to the nearest anchorage, to regroup and spend the night out of the worst of the weather, so we motored a couple of hours to the nearest anchorage, which is at a town called Caleta de Campos. This turned out to be a sweet town, and we stayed there a few days to enjoy playing in the surf and to wait out the weather. We dinghied ashore the first night to get some dinner for New Year’s Eve, only to find that most places were already shut down. (We never did really figure out why that was!) There was a boisterous group in one of the beach restaurants, though, that turned out to be about 10 20-something guys playing with a “beer bong” and chanting as each one took a turn chugging as much beer as could be poured into a 5 foot 1″ hose. Some of them were seriously drunk! But one of the guys emerged from the crowd to welcome us to Caleta de Campos and he encouraged one of the restaurants to open up for us to have dinner. A few young families played nearby with sparklers, as the little children danced with glee. We spent the next three days in this very authentic beachside town, and never saw another gringo face. Friday morning we took James to shore for the last time, as he went to catch a bus further south. His intent is to go to a language-immersion class in a town called San Cristobal, and then resume his sailing adventure down the coast a few weeks later. It was sad to see him go – he proved himself to be a wonderful traveling companion, easy-going and full of life, and willing to lend a strong hand whenever it proves useful. Now we’ve turned north again, to find a place (or two) where we can get a sail (or two) repaired and perhaps get one (or two) new replacement sails built. We’ll need some professional guidance on which sails are salvageable. We’re motoring north, but we’re enjoying ourselves and we’re not in a hurry. Life is good, even when it looks different from the plans that we had created!